Sutton's Place by Tom Acitelli. 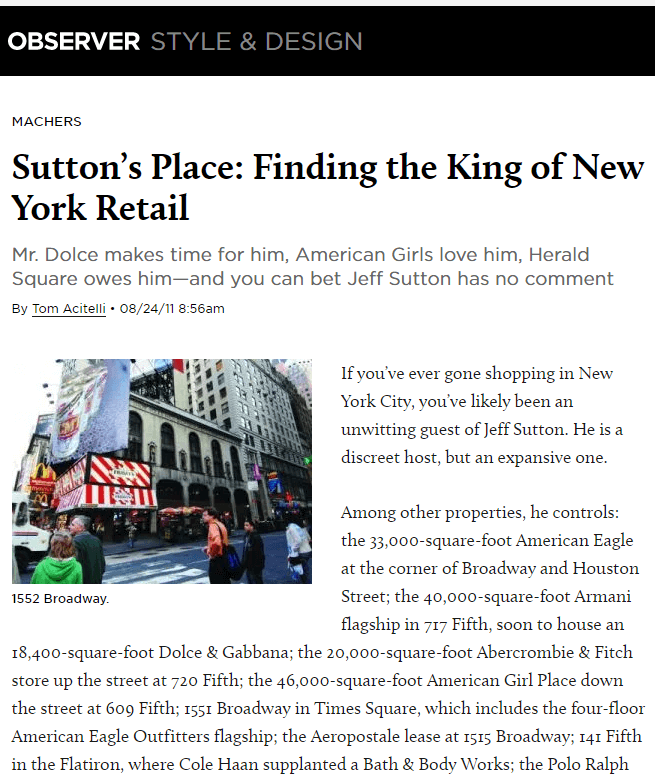 Mr. Dolce makes time for him, American Girls love him, Herald Square owes him—and you can bet Jeff Sutton has no comment. If you've ever gone shopping in New York City, you've likely been an unwitting guest of Jeff Sutton. He is a discreet host, but an expansive one. Among other properties, he controls: the 33,000-squarefoot American Eagle at the corner of Broadway and Houston Street; the 40,000-squarefoot Armani flagship in 717 Fifth, soon to house an 18,400-square-foot Dolce & Gabbana; the 20,000-squarefoot Abercrombie & Fitch store up the street at 720 Fifth; the 46,000-square·foot American Girl Place down the street at 609 Fifth; 1551 Broadway in Times Square, which includes the four-floor American Eagle Outfitters flagship; the Aeropostale lease at 1515 Broadway; 141 Fifth in the Flatiron, where Cole Haan supplanted a Bath & Body Works; the Polo Ralph Lauren space at 379 West Broadway in Soho; several spots in and around Herald Square, including the Foot Locker House of Hoops, Aeropostale, Aldo, Geox, American Eagle and Esprit; and 747 Madison Avenue, the location of the Valentino flagship. Just last week, he teamed with SL Green, the city's biggest commercial landlord, on the $136 million purchase of 1552 Broadway, which contains the Times Square TGI Friday's. That is just a sampling. He owns much more in Manhattan, the boroughs and surrounding areas-an empire of 115 buildings carefully, yet aggressively, amassed since the early 1990s. At times he has worked with partners like SL Green, but often Mr. Sutton relics entirely on his own capital, which he built up from early hustling in the scrappier, crappier New York of Dinkins and Koch. It is an empire that helped change the cityscape, particularly Herald and Times squares, and has redefined the way deals for high-end retail can be done. Today, from his home in the tightknit Syrian-Jewish community in the Gravesend neighborhood of Brooklyn, he maintains his holdings with a canny reticence. You would think the man would want to brag. Or to put it in journalistic parlance: You would think Jeff Sutton would be an easy quote.The Observer discovered otherwise. We found him to be among the most elusive titans in New York real estate, certainly so in its retail sector. In point of fact, he first reached out to us. It was the late winter, and The Observer was putting together our annual Power 100 list of the most significant people in New York real estate. Mr. Sutton, 51, called out of the blue-unlike every other entrant who called, there was no publicist nor executive assistant acting as a buffer-to gently remind us of his domains should we be considering putting him on the list. We made arrangements to get together for coffee one day soon. That day never came. Months later, as we began calling around, talking to people who have either worked with him or know him through his work, a theme emerged. "He's a very tenacious guy; he's very charming; and I think the best attribute is that he knows his business better than anybody:· said Andrew Mathias, the president of SL Green, which first partnered with Mr. Sutton in the early part of the last decade on a financing deal at 609 Fifth. Mr. Sutton flew to California to wrest American Girl into 609 Fifth at a time when executives there were considering Tishman Speyer's Rockefeller Center. He also jetted to Milan to see Domenico Dolce to convince him and Stefano Gabbana to take the 717 Fifth space. And he went to Columbus, Ohio, to pitch the chairman of Abercrombie & Fitch. In every case, he showed up with video presentations, imagining for the retailer the would-be foot traffic and physical surroundings. We called some more people, and dug into clips, our own and those of Lois Weiss, the longtime New York Post columnist who has broken some of Mr. Sutton's biggest deals in New York with SL Green. Mr. Sutton's march to masterminding the highest-end retail in New York begins with a humble-dare we say, AI Bundy-like-avocation: discount shoes. It was the late 1980s, and Mr. Sutton, the son of a retail importer, had graduated from the Wharton School (in 1981) and was trying to break into New York real estate with no money and no reputation to speak of. Looking back, it seems he picked a fortuitous time. Not only was there a recession on, but the industry was a different animal: less formal, more bare-knuckled, button cuffs rather than French. The old first and second-generation guard, who still commanded the industry, held court more often at construction sites than in corner offices. With the right idea, an unconnected parvenu could score a stake. Mr. Sutton's was simple enough, if risky: he would get the lease first and the space second, using the money from the lease to buy the space. (Normally, in retail, a broker shows vacant space and the tenant takes what's available, the equivalent of your last apartment hunt. Mr. Sutton created a universe where retailers could take spaces whet her they were vacant or not.) He tried the idea out first on Pay less Shoes in the early 1990s, when the retailer wanted to break into the New York market. He would drive Payless executives around Brooklyn, Queens, the Bronx and Upper Manhattan, and he would ask them where they wanted stores. They would point to a storefront; and Mr. Sutton would then go to the storefront's tenant and offer to buy him out. If that didn't work, he would offer to buy out the landlord, and in some cases made the tenant he was representing his own subtenant. It worked. Mr. Sutton took his idea to choicer Manhattan in the late 1990s, starting with CVS, and grew from there, eventually connecting with Mr. Mathias at SL Green. For a time he partnered with other Syrian Jews from his neighborhood, but that seems to have tapered off (perhaps the dollar amounts got too large to be comfortably transacted with the neighbors?). On the other hand, SL Green, which today owns roughly 5 percent of New York City's commercial space, had phenomenal capital at its disposable, as did Mr. Sutton's Wharton Properties. The spree was on, though it would take some time for the rest of the industry to notice. According to those who know him well, People universally say he's a nice guy, a genuine article in an industry that can seem oleaginous to the extreme. He was scoring over and over, commanding some of the highest retail rents in the nation, even through the Great Recession. The rent of the American Eagle store at 1551 Broadway averages $20 million for the life of the lease; for Aeropostale, it's north of$11 million: for American Girl, it's about $7 million; for the new Dolce & Gabbana, it will be $16 million for the first year alone, according to a source with knowledge of that and other deals. All the while, Mr. Sutton has lived a quiet, private life in Gravesend, where he grew up (his grandparents were all immigrants. And while it may be quiet, it is far from quaint – the borough's reigning record home sale was $11 million in 2003 for a 3,600-square-foot spread that was immediately torn down to build a mansion nearly three times the size. The neighborhood also claimed 2009's biggest deal: $10.26 million for an 8,206-square·foot house.